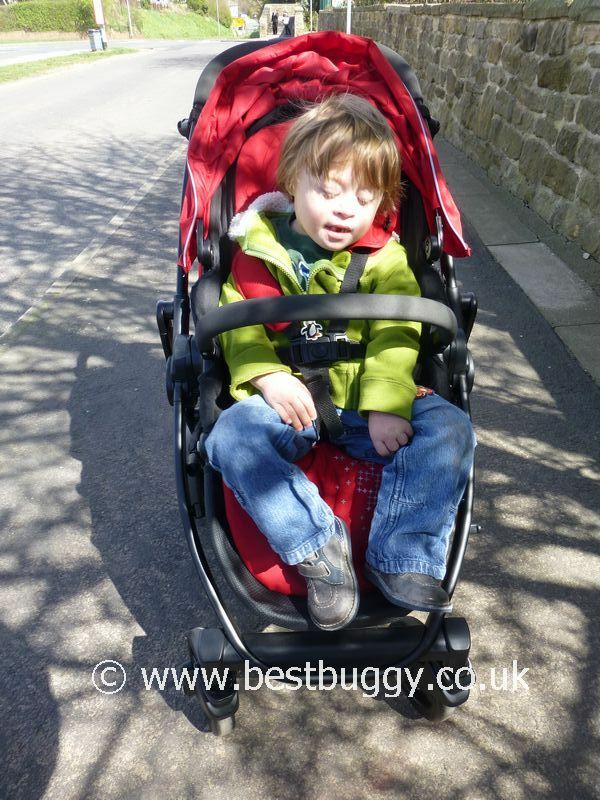 The Graco Evo is one of our all time favourite pushchairs. 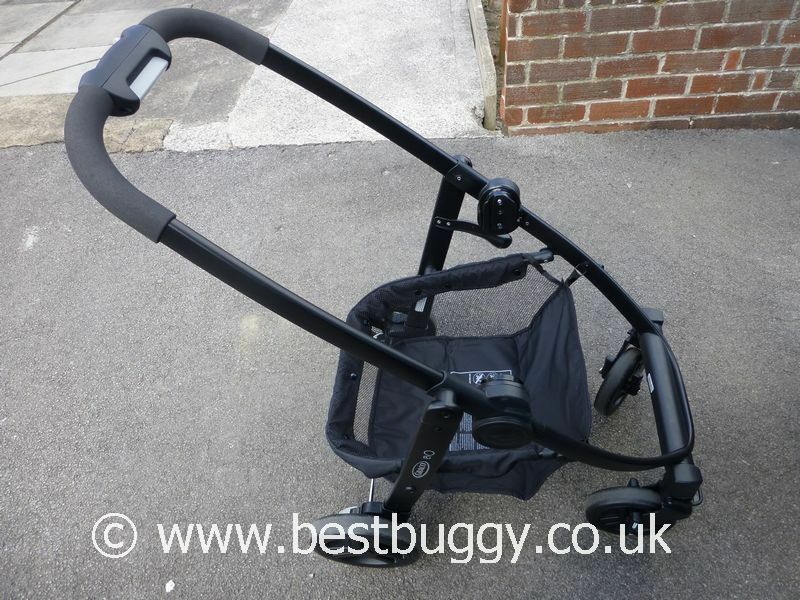 The Graco Evo looks great, is packed with features, is one of the lightest pushchairs we have tried out, comes with everything you could need and more, and is all at an affordable price. 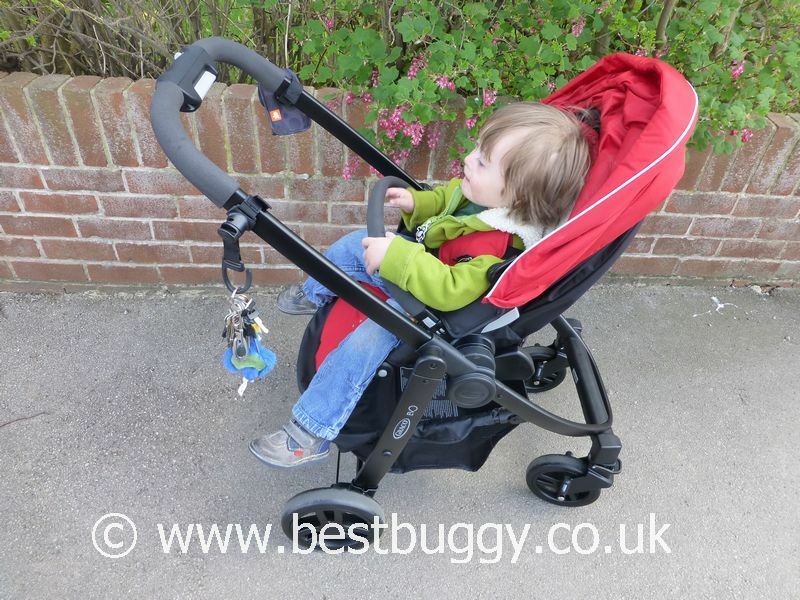 Our first impressions of the Graco Evo was that we were surprised just how light the chassis and seat were. 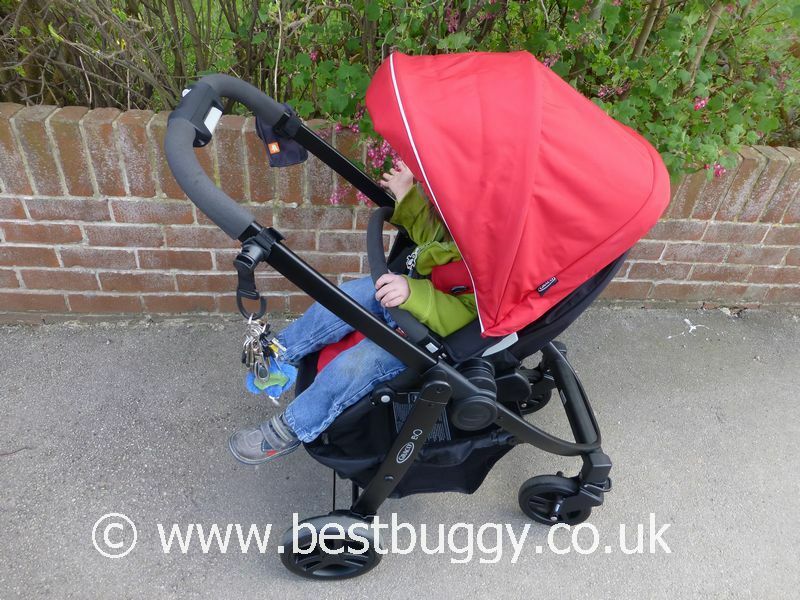 The Graco Evo weighs just 9.5kgs, which is 0.3kgs lighter than the iCandy Cherry, and is just 1kg heavier than the Bugaboo Bee. 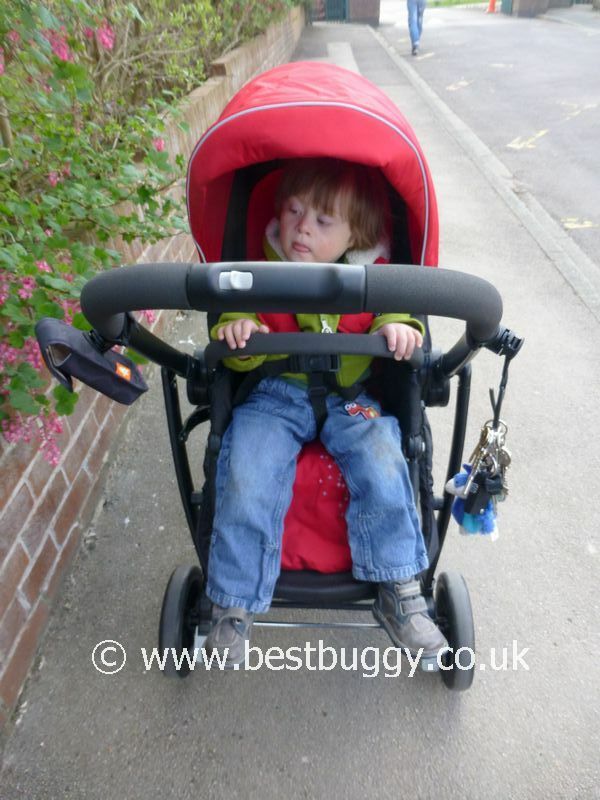 For a pushchair with a framed seat, the Graco Evo really is light. What also surprised us, was exactly how much you got in the box. There was the seat, black chassis, a raincover, a footmuff, the wheels and the brake! Everything you need is provided! The brake and wheels needed attaching before anything else, but they were easy to do. The brake simply pushed into position. The wheels had pins which needed pushing into place (a bit fiddly but easy enough), and then a cap was fitted over the top to hide the pin. The wheels then slotted into position and we were ready to go! The Graco Evo seat can both parent and forward face. The seat is incredibly easy to remove and turn around. The seat itself is very light, and the release buttons only need a gentle touch to release the seat. The seat drops decisively back into place very easily. For ease of use the Graco Evo really wins points. Everything is very simple but effective. 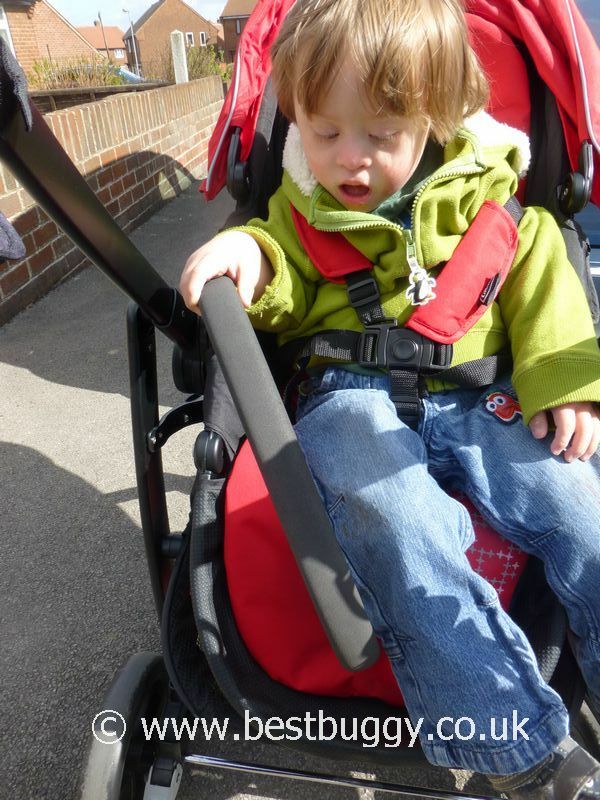 The seat unit is suitable from birth which is quite unusual to see on a pushchair with a ‘framed’ seat. Instead of the seat tilting (a bucket seat), the rear of the seat drops down through four different positions from upright to lie flat. (Although officially we believe the seat should only have three positions - see our photos though – but if your Evo only has three positions, then don’t blame us!) The seat recline release handle is situated at the rear of the seat. This handle is rudimentary, but it does the job well! What really surprised us about the Graco Evo is that the seat is a very generous size. There is plenty of room under the canopy for even our tall (107cms) 4 and a half year old. Our 2 year 9 month old (87.5cms tall) looks really comfy in the seat too. 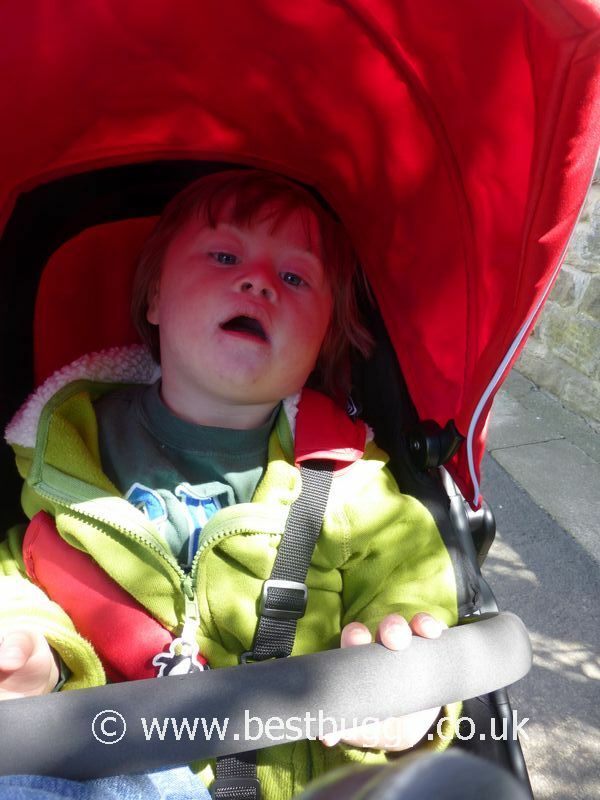 Our eldest has no complaints about the seat, and in fact she liked it that much that she demanded that we whizzed her around the garden – and the Graco Evo took the rough grass, paving slabs, kerbs etc. in its stride even with her weight on board. It was quite amazing how easy the Evo was to push and manoeuvre. 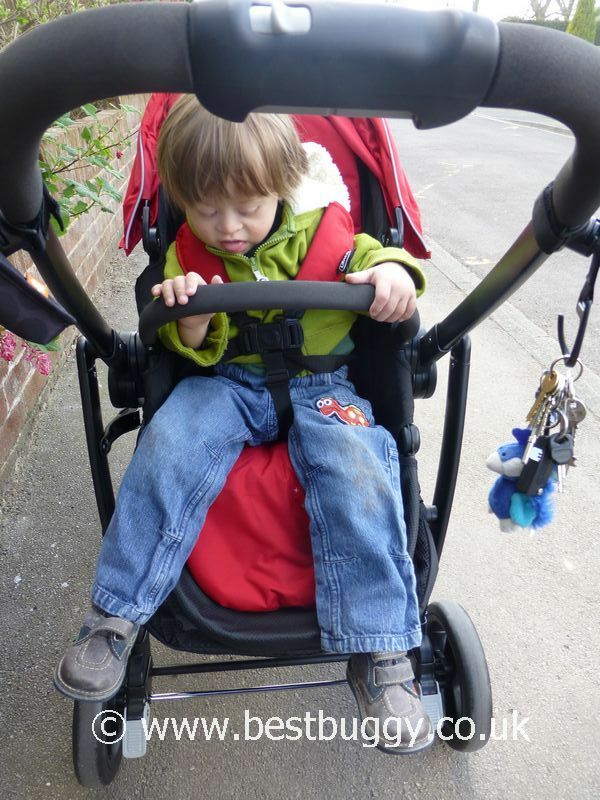 We absolutely loved that the seat frame has an adjustable footrest, which offers good leg and foot support for a younger child; but especially that the seat footrest can be pivoted backwards, thus tucking it away, and allowing an older child to have clear access to the lower footrest. Instantly, the longevity of the Graco Evo is been increased. 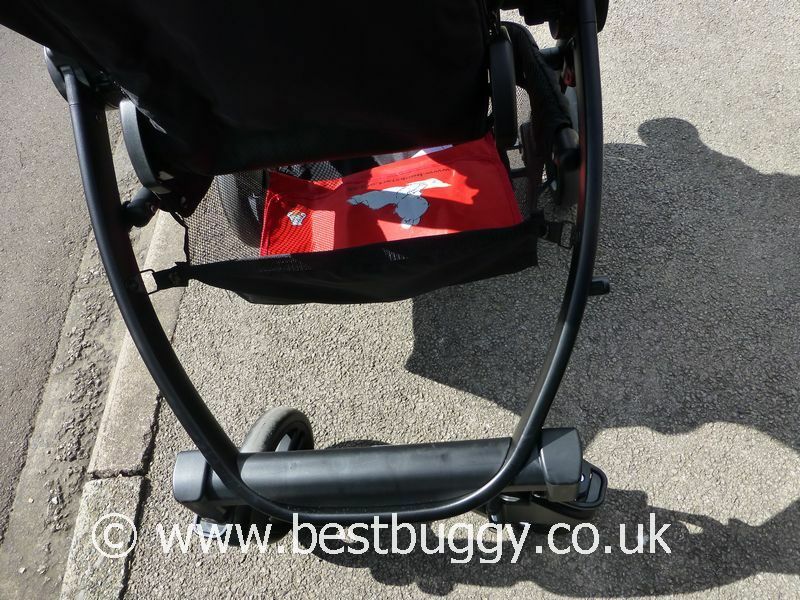 It may sound something obvious, but it is amazing how many pushchairs look like they have a lower footrest for an older child, but yet in reality there is no way a child can get their feet comfortably on the footrest. The Graco Evo has that perfect combination of foot support, for both a small and a larger child, whether awake or asleep. The Graco Evo comes with a liner which velcros into position to stop it moving, and can be easily removed for washing. The Graco Evo also comes with a fleece lined footmuff. This is not the thickest footmuff we have seen, but it is a lovely touch to include a matching footmuff, and it is perfect for changeable spring or autumn weather. A blanket added inside would see your little one warm through the winter months. The hood is a generous size with a small visor. It offers good protection in winter and reasonable shade in summer. There is a raincover for wet days. This is tight to fit around the footrest, but we like the access flap at the front. The reflective white piping of the fabric is a good touch for the winter months. The harness was so simple to alter – simple but effective – simply unzip the panel at the rear, push through the harness straps, and reposition. Again, there a small detail which makes a big difference. 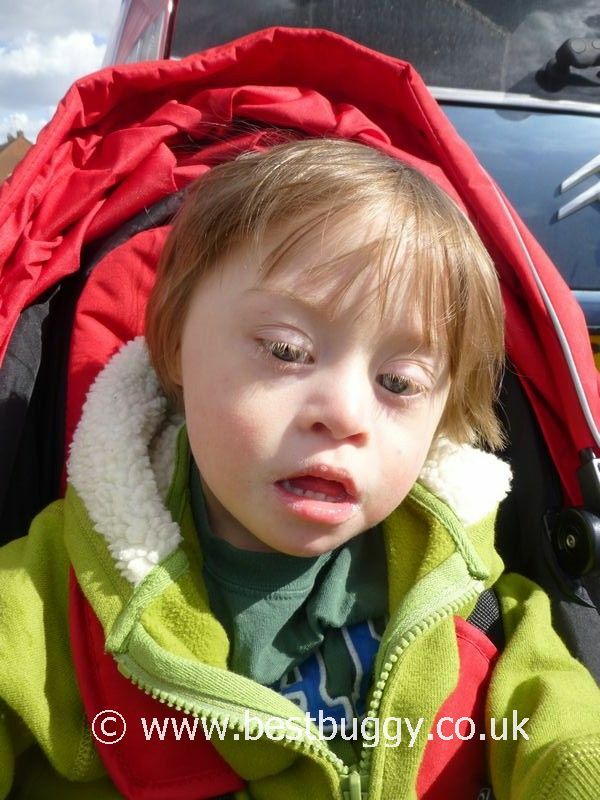 The harness has a choice of two “stop” positions on it, which means the harness can be made really tight for a young baby, or can be pushed past the first “stop” to be much longer for an older child. This makes the harness very adjustable. The harness is a 5 point one, and can be split into 5 points. This is a bit annoying because the harness breaks into 5 points, every time it is undone. This makes it harder to do up a wriggly child. The Graco Evo has a generous basket. There is plenty of room for bits and pieces, or even a changing bag in the basket. The access from the rear is good when the seat is forward facing. Access is hard when forward facing, but lifting the footrest up helps access. 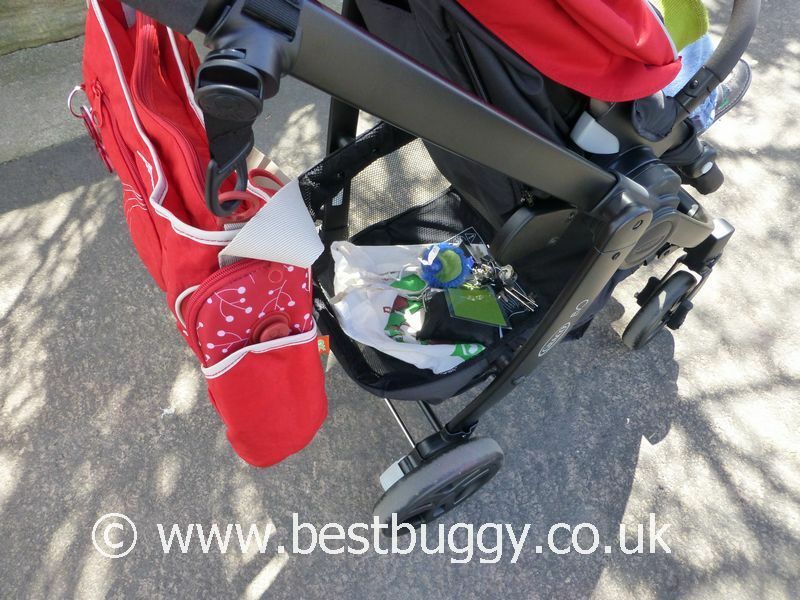 Our red okiedog changing bag fitted well into the basket, and also hung nicely off the handlebar behind the seat. 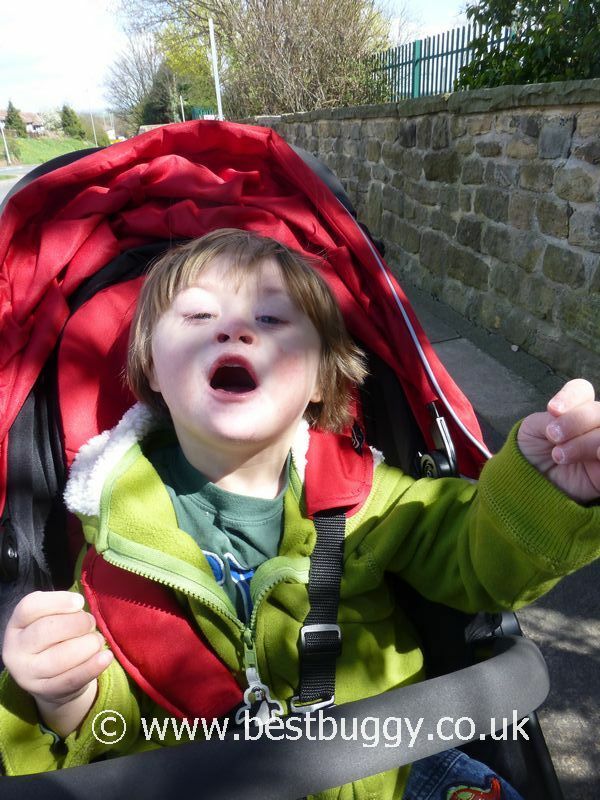 We thought the colour and pattern of the bag matched the Graco Evo fabric well! The handlebar is foam covered and feels good to hold. However the handlebar height is fixed. Not having an adjustable handlebar is the only detail which I would consider lets the Evo down. However the 102cms height is fine for me at 5ft 6ins. 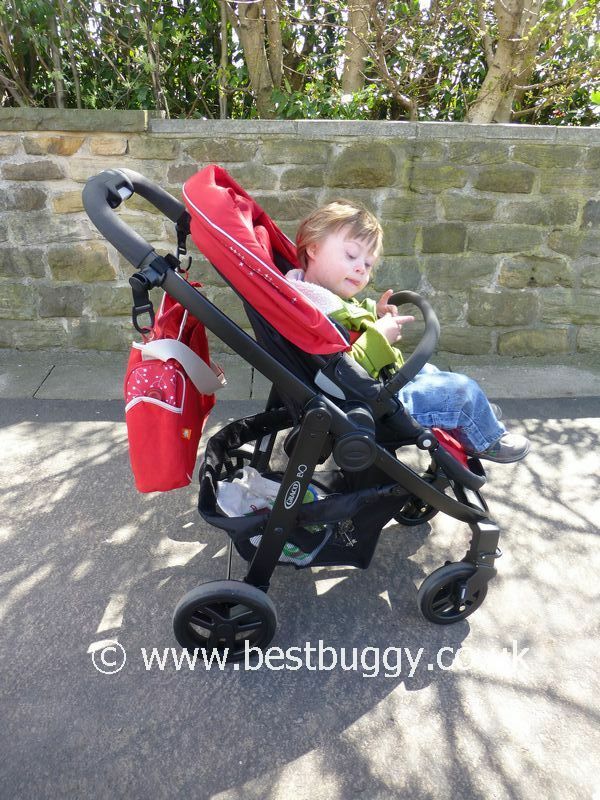 The Graco Evo has two large 23cms wheels at the rear, and two smaller 18cms lockable swivel wheels at the front. These are plastic puncture proof wheels, but once again Graco have come up trumps. 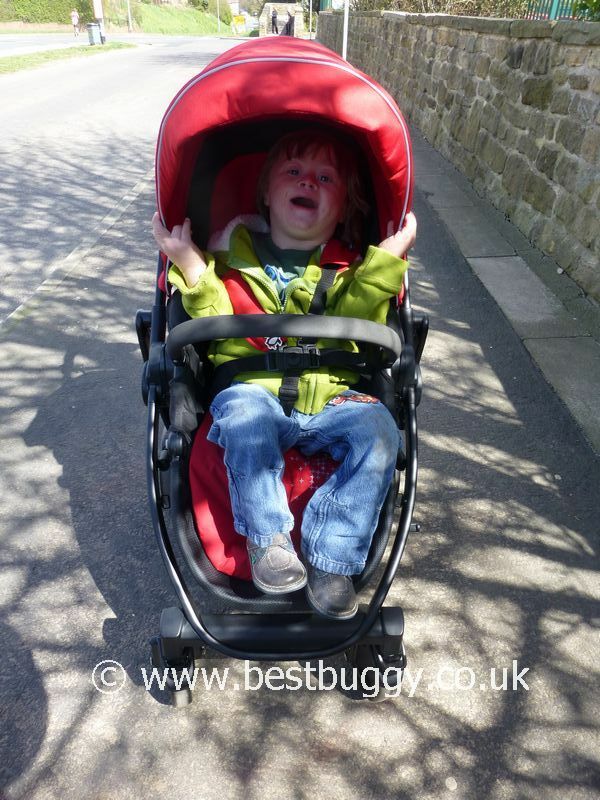 SO many good pushchairs are let down by cheap looking wheels. Whilst these wheels are clearly plastic, they dont look that cheap! There is clearly suspension on the Evo, although the wheels will never give a smooth ride off the beaten track. 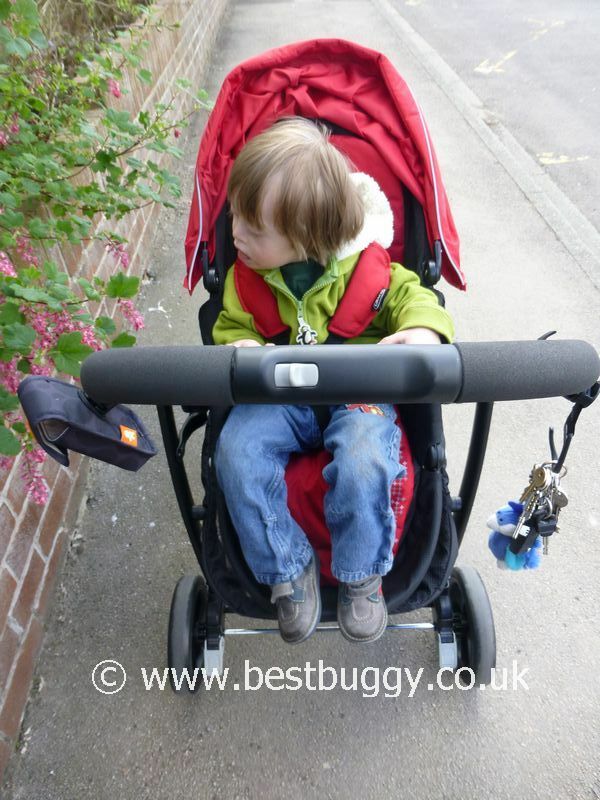 The Evo is really an urban pushchair, although as we said at the start, the Evo coped really well with rough grass, kerbs etc. and we would happily take it to the park with us. Although most people probably don’t lock their front wheels often, we do lock ours regularly. We found that the lock slider was too near to the quick release button, and we kept finding that we popped the wheels off instead of locking them. Having said that, the quick release wheels work very well if that is what you want! The Graco Evo has two brake buttons situated on either side of the back axle by the rear wheels. Simply click one of these down to apply, and flick off to go again. 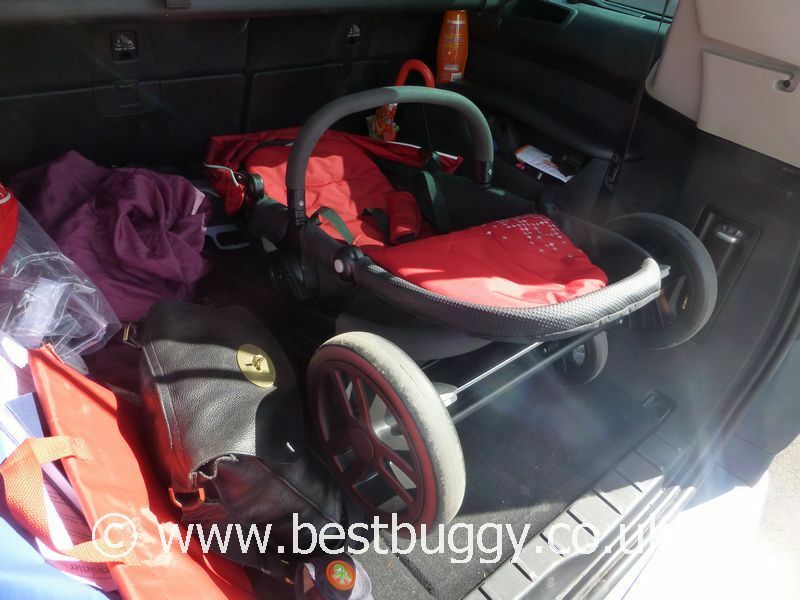 Even though the Graco Evo is suitable from birth, there are also carrycot and travel system options. 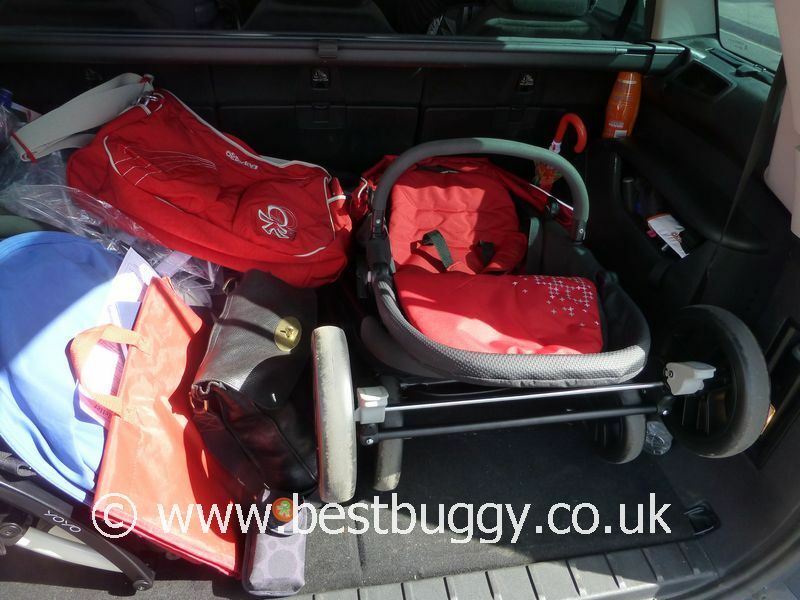 A Junior Baby infant car seat can be fitted onto the chassis with the addition of the car seat adaptor (included in the car seat box). The Graco Evo can fold with the seat on forward facing. 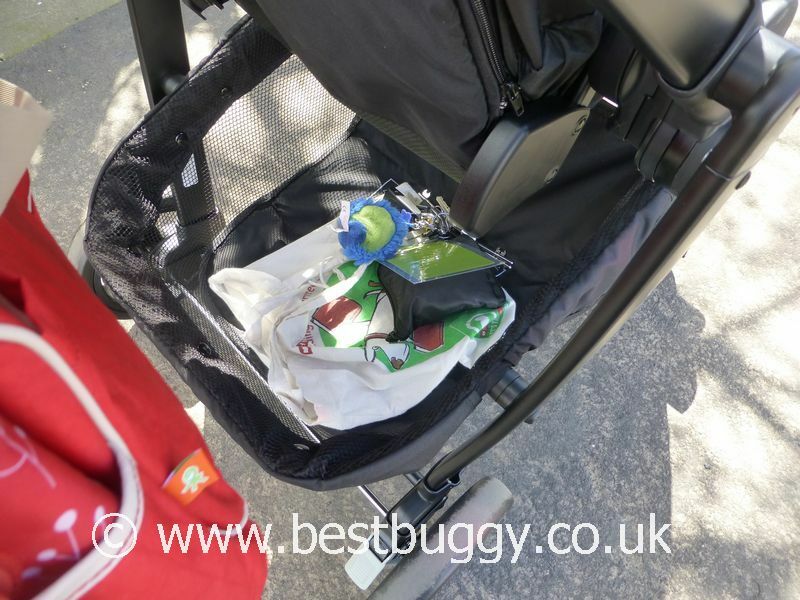 The Evo is very simple to fold and can be done one handed - simply slide the grey button on the top of the handle and then squeeze in the larger grey button on the rear of the handle and the pushchair folds in half towards the floor. There is a handy autolock to keep the Graco Evo folded. The Graco Evo is quite long when folded with the seat on, although the footrest can be folded down to give a more compact package. However this is where the light weight of the Evo wins, because the Evo is really easy to lift and carry. 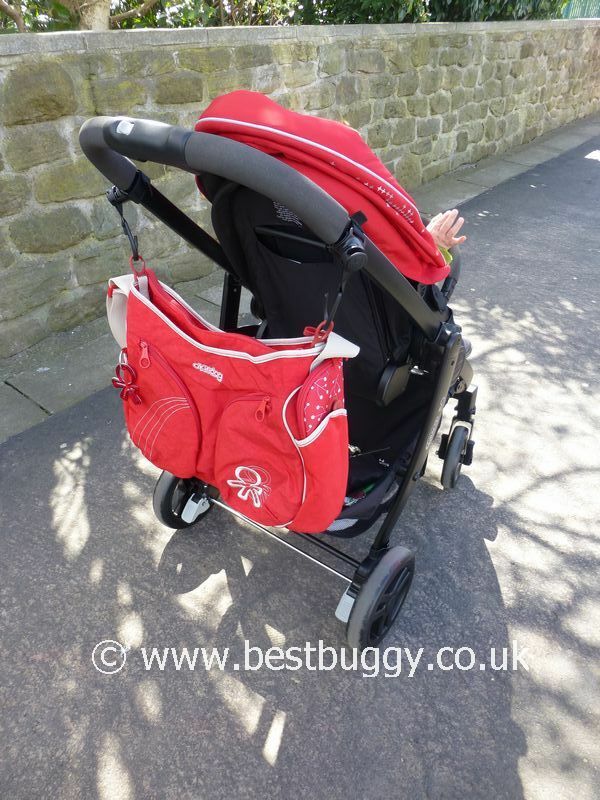 This is one pushchair which I would consider carrying up stairs because the folded package is so light, but is also neat, with no flappy bits. 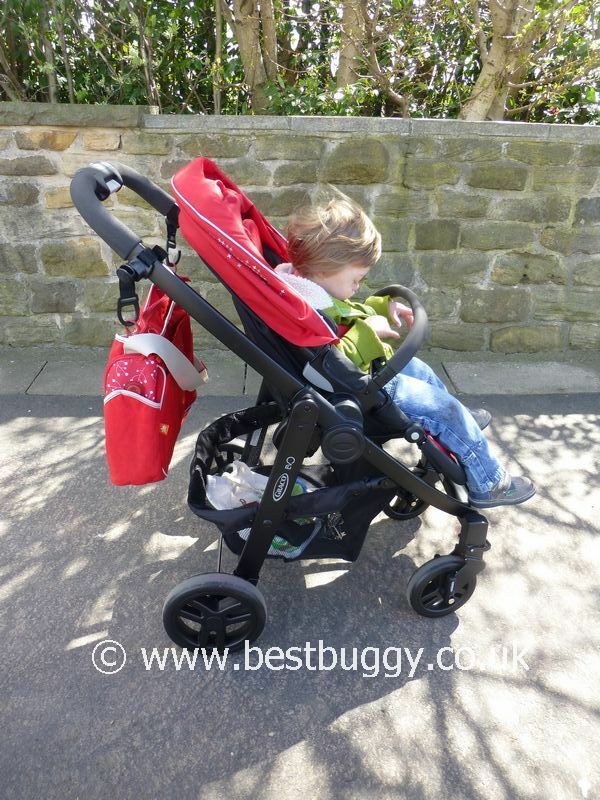 The pushchair is logical to carry (some aren’t!). The seat needs removing if it is parent facing. To be honest, the seat is so simple to remove, that it was no issue to do so. 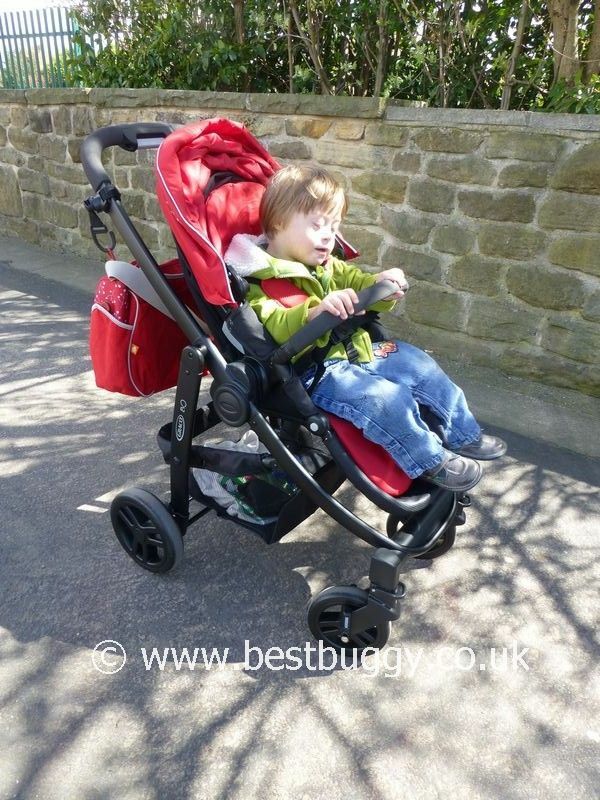 The seat then nests neatly inside the chassis for storage, or can be fitted forward facing to keep the pushchair as a one piece fold. Opening the Evo is simple – undo the storage lock and pull open until the chassis clicks into the open position. 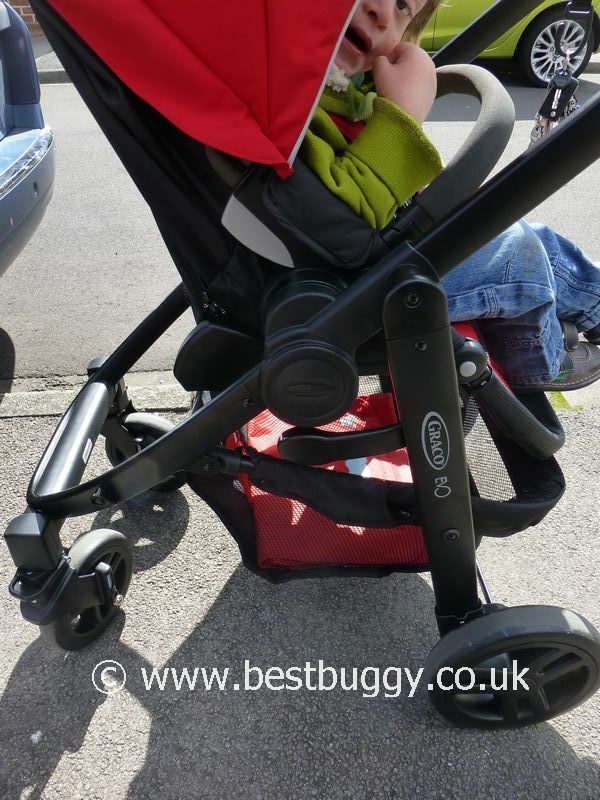 We, at Best Buggy, think you would be hard pushed to find an urban pushchair with so many features: with a seat that is both suitable from birth; but also can easily handle a bigger child well; and which looks so smart; for the price of the Graco Evo (£279.99). 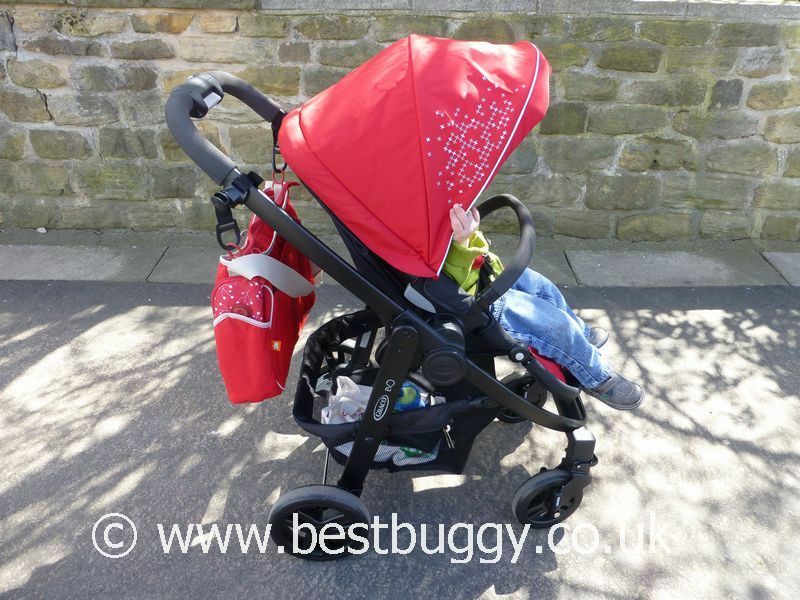 Details like the large basket, swing away bumper bar, lie flat seat, included footmuff, liner and raincover are all fantastic to see, and are often not found on more expensive pushchairs. 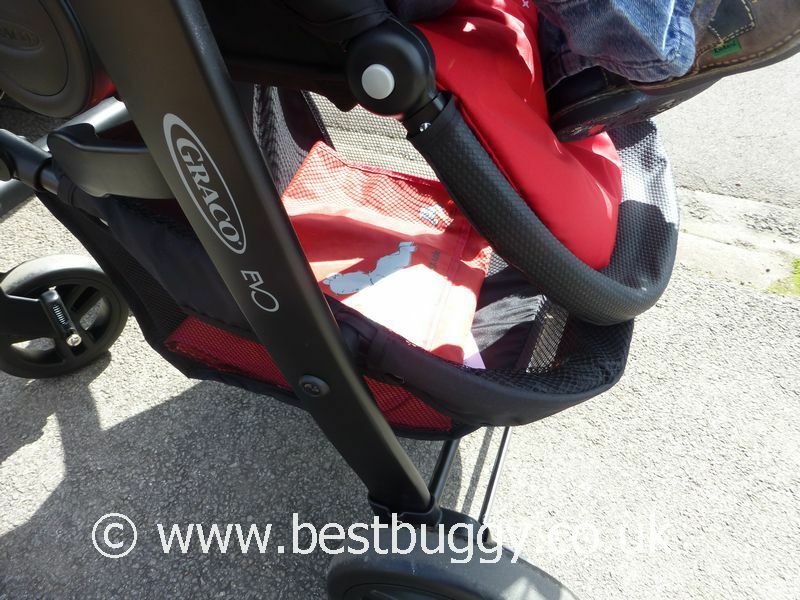 It is great that there are carrycot and car seat options if preferred or required, but the Graco Evo seat unit will easily see your child through from birth to three with no need for anything else. Best of all the Graco Evo is light to carry, and is easy to push and manoeuvre, even when fully loaded. The Graco Evo really is a great combination of style and features at an great price. We love it!